The Rockford IceHogs are proud to announce that Collin Delia has been named the team’s winner of the IOA/American Specialty AHL Man of the Year award for his outstanding contributions to the Rockford community during the 2017-18 season. Delia spent the first four months of the season bouncing between the IceHogs and the ECHL’s Indy Fuel, but even during his limited stints in Rockford, became an endearing figure in the local community. His determination on the ice and in the locker room were matched only by his graciousness to give back to the Rockford area, and by the end of the 2017 calendar year, Delia was already one of the more well-known figures of the IceHogs organization. 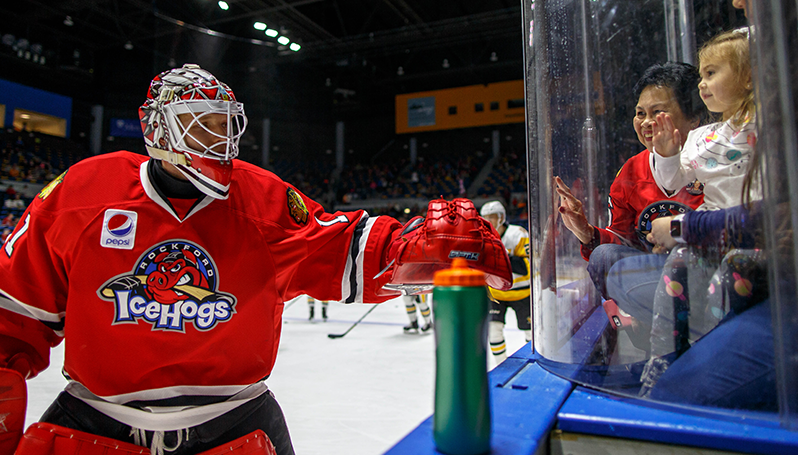 Beginning with donating his time at a season ticket holder event on his first night in town, Delia has always sought opportunities to make a positive impact on fans of the IceHogs. He made numerous visits to local hospitals to visit with patients, including leading the annual delivery of teddy bears to sick children as part of the Teddy Bear Toss initiative. As the season continued, Delia returned from Indy and once again contributed to charitable endeavors by taking the reins of the Hogs’ Anti-Bullying program. He assumed a leadership role in the program, which had remained vacant following the departure of longtime IceHogs forward, P.C. Labrie, and helped spearhead the campaign’s mission of “be a buddy, not a bully.” As of March, Delia has made numerous visits to local schools as part of the team’s Anti-Bullying initiative. Delia has also been extremely generous with his time in volunteering to visit with and assist children with special needs. Whether at the arena during postgame meet-and-greets, or in the Rockford area at local schools, Delia has truly championed his personal endeavor to be a positive role model and contributing member of the community. Delia is now one of 30 finalists for the AHL’s 2017-18 Yanick Dupre Memorial Award, honoring the overall IOA/American Specialty AHL Man of the Year. The league award is named after the former Hershey Bears forward and AHL All-Star who died in 1997 following a 16-month battle with leukemia. The winner of the Yanick Dupre Memorial Award will be announced by the American Hockey League at a later date.